It's hardly a horror story; in this game, Edna apparently made a dire mistake in one of her recipes/experiments. The resulting explosion sent her flying out of her tower one way, and her shadow was magically blown separate from her in the other direction. That is, the cool kind of shadow; not just some wimpy black figure on the ground. It's your job as Edna (and her shadow) to move about the withered, grassy spaces of the Haunted Woods, collecting various ingredients for a potion to fix her shadow back in place while avoiding generic harmful baddies. There are several levels in the game, each with great variety in structure and difficulty; don't be surprised if you need several tries to get past one of the later levels. While you may be led to think that Edna's Shadow is a regular, fairly uninteresting game, it has a nice added twist: you're acting out both Edna and her shadow, and when you move Edna her shadow will go in the opposite direction. When you make Edna go right, her shadow goes left; when Edna goes left, her shadow goes right; they both go up and down together, though. It may not be a stimulating addition to the gameplay, but it adds some required coordination and, to some people, extra fun. After you collect all of the ingredients on a level, you have to get both of the Ednas back to the big red cauldron in the level. Though it may sound easy, it actually becomes very difficult later in the levels because you have to get both of them neatly onto the squares beside the cauldron, rather than just having them touch them; that's a lot tougher when they're not lined up symmetrically in the game. You'll know that you've collected all of the ingredients when the cauldron bubbles green. Oh yes, navigation is quite different than movement. Especially when you have to correctly position Edna and her shadow in every single level to continue on to the next; while it'd be nigh impossible to show you how to do it in all of the levels, since the parallel-ality of Edna and her shadow are different in almost every situation, I'll give you some help on how to sort it out on your own. 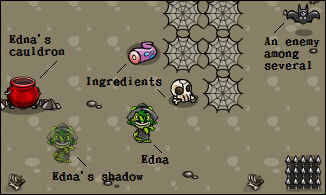 Take a look at the below screenshot; after going after ingredients, Edna and her shadow are un-parallel to each other. That problem needs to be fixed since they both have to be to the exact left and right of the glowing cauldron to get past the level. So, you need to use the specific placement of walls and other barriers in the level to place our heroes parallel to one another. If they both go along the arrows, they'll be parallel. While the enemies in the game are nothing special, the life system is: you have only one life and to lose it, both Edna and her shadow have to touch a baddie. In a way, that's good; when one of them is hit, they will be wrapped up in something similar to bandages and you'll have to direct their opposite over to rescue them. Just make your way over to the damaged Edna/shadow and touch them; they'll be healed up, simply enough. Keep in mind that while one of them is hurt (and so can't be moved in any way), the other can't collect any ingredients. You don't just have to avoid the enemies, though: when on the square next to them, you can shoot a spell at them by pressing your space bar and zap them into oblivion, making them disappear from the level and giving you a few extra points. The main points you get in the game are from getting ingredients and zapping baddies: five points for every ingredient, ten for every enemy. However, you also get bonus points for however much time you have left when you complete a level; you get a point for every second left on the clock. Later in the levels you'll also encounter destroyable boulders, marked by glowing cracks all over them; just zap them like a regular baddie to get rid of them, although they're not harmful to you even if you touch them. Underneath is the occasional apple core, explained further below. There are four different items other than ingredients in Edna's Shadow, most of which are pretty good. The first three appear randomly throughout all of the levels, disappearing a few seconds afterward if you haven't collected them by then. Just walk over them to collect them; they start appearing only after you've gotten to the third level. The old-fashioned pocket watch is a time booster that adds ten seconds to your level countdown. The little red potion is a reversing potion that switches the arrow key movements for Edna and her shadow; that means the keys will work regularly with the shadow instead of Edna. 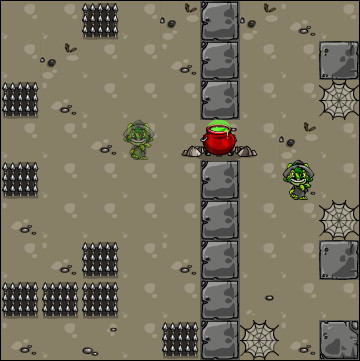 The odd, green, glowing orb is a stunner that freezes all enemies for a few seconds. You'll only find the apple core under destroyable boulders and, like ingredients, they give you five points each. Typing "Edmoretime" will gain you an extra 20 seconds. However, like many other codes, this only works once, so make sure to use it on a stage you run out of time on very often. Anything that's not a baddie or special item is an ingredient, so don't be shy about picking up skulls, sandbags and the like. Anything that's moving, avoid; that includes the weird tree baddie that occasionally stops dead in its tracks for a while. You can even go right up and bump against the spider webs and spikes. Don't be daunted by this long guide, though: in the end, you might find that after some time Edna's Shadow is a very fun game. Maybe you'll never be good enough to get a trophy, but don't sweat it; enjoy playing!